Following on from the various work-mounting ideas put forward in the last issue, this month I am taking an in-depth look at chuck-based workholding. Firstly, I will look at the fundamental mechanics of chuck jaws. And secondly, we will examine how to extend their uses and how to integrate the aesthetic design of a workpiece with the practicalities of actually holding it whilst it's being turned. with a new component, their minds are automatically channelled to exclaim: How am I going to hold that? Hence workholding ingenuity runs in engineers' veins. However, looked at it broadly, this still leaves many turners with a limited grasp of what is involved. The widespread use of proprietary chucking systems, whilst clearly a boon, has paradoxically led to a poorer understanding of workholding. This may be why there appears to be fewer turners progressing to more interesting, and technically more satisfying, projects. Inevitably there will always be turners who relish a challenge, and who will achieve great things without input from anyone else. The objective here is to open up a few fundamental areas of woodturning, hopefully to help bridge some of the know-how divide, and fire up your enthusiasm to try something different. Holding a piece of wood might seem to be a dry-as-dust subject, but it is worth knowing, and hopefully the use of clear diagrams instead of photographs, which often show everything but reveal nothing, will help to make it more relevant, and minimise the yawn factor. 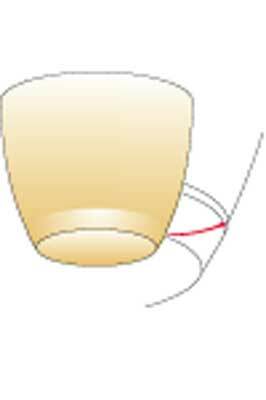 Moreover, the current fashion to remove all traces of the jaw-holding form to leave a flat base, irrespective of the overall effect on a workpiece, needs to be reassessed because it is too often done without regard toits aesthetic and practical design. To draw an analogy: not that long ago scraping was not considered by some turners to be proper turning, even if it was the only practical technique for a particular part of a job; scraping is back in fashion, and the value of that technique, well appreciated by our forebears, has become recognised again. The majority of chucks on the market today have so much jaw movement that it's difficult to know at what position in the jaw will provide the most effective, and accurate hold. 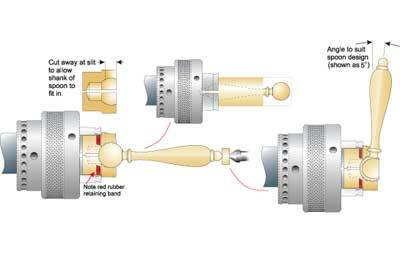 Hence the tendency to over-tighten the chuck on a workpiece to try and compensate for poor holding contact. This is understandable as nobody really fancies a lump of fast moving wood in their face, however, over-tightening is no real solution. Crunching "gripper" style jaws into a lump of wood is not an issue when only a one-off positive hold on the workpiece is required, but it is a disadvantage for more refined working where accurate re-mounting is necessary. Gripper jaws are hardly the most economic when expensive pieces of wood are involved. Additionally, there are a fair number of dovetail style jaws on the market with poor lip profiles. In other words, the edges - internal or external of the dovetail edge - have been machined off, and consequently the efficiency of the grip is diminished. First, let's deal with what is at the heart of holding wood, a pressure-sensitive material that doesn't have many helpful characteristics such as those found in most metals, or other materials requiring machining. 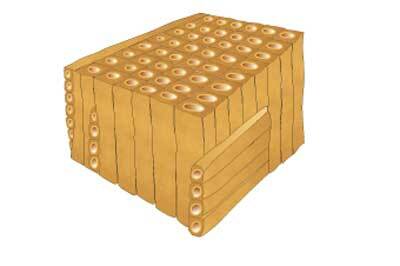 Wood has a fibrous cellular structure (see micro view in image 1), with fairly poor homogeneity and structural stability, plus the fickle factor of moisture variability. Put bluntly, it unhelpfully compresses when it is gripped, distorts easily because of its spongy structure, constantly warps as stresses are relieved and moisture changes, and splits without much provocation. But, like our children, we see the beauty and forgive the faults. 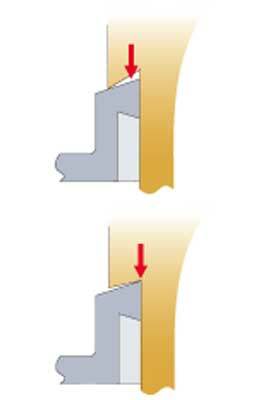 An undersize workpiece has poor annular contact with the jaws, and is more likely to move off axis and spoil the work, or even possibly fly out of the chuck. Good annular contact where the jaws form a closely mated collar around the workpiece, ensures concentric, firm and effective workholding. 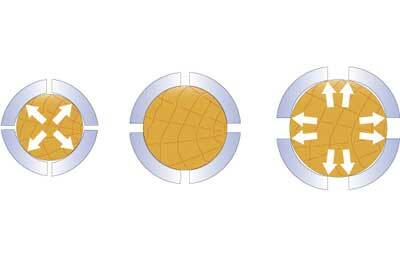 Holding oversize diameters causes the corners to dig in. This easily collapses the cellular structure of the wood which means surface damage, possible extrusion off axis because of the different densities, a much reduced grip, and again, a risk of work flying off the chuck. 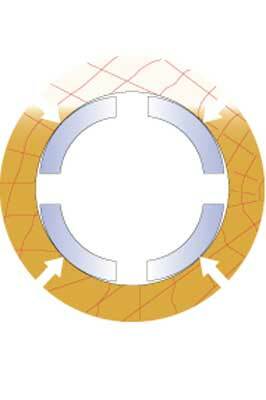 The same is also true of expansion holding, but with the added risk of the wood cracking by over-tightening. An important point to consider is the effectiveness of holding power in the area of contact. It's good to have the radii of the jaws matching that of the workpiece in the vertical (or face) plane, but how they seat to the workpiece can be equally important. 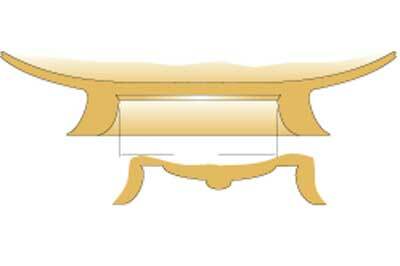 A typical over-deep dovetail form with poor jaw contact, which in turn means a weaker, and less positive hold. The dovetail is less than the angle of the jaws, but it is well seated and allows the jaws to locate more positively and deeply in the recess. Perfect angular contact would be more effective, but as even tip contact would have probably still have greater than 80 per cent of the holding power, it is less important. Whilst being far from definitive, this section suggests how holding forms can be incorporated into the design of a workpiece, or how jaws can be made to cope with different shapes and diameters. This article can only cover a small selection of ideas in the hope that it will fire the imagination and encourage more readers to experiment in this area. One may ask why. As someone once said: "Isn't it a pleasure to turn over a particularly fine piece of work, to find the turner hadn't stopped at the obviously visible." This simple cup form does not appear outwardly to offer any opportunity for jaws to grip it. However, a slight, almost invisible opposite step about 3-5mm (1/8-3/16in) in from the base does the trick Note: it does require the jaws to have a good dovetail lip profile. This simple cup form does not appear outwardly to offer any opportunity for jaws to grip it. However, a slight, almost invisible opposite step about 3-5mm (1/8-3/16in) in from the base does the trick Note: it does require the jaws to have a good dovetail lip profile. Here, the outward swept foot has a very narrow dovetail which would be almost impossible to detect, particularly if it was blended into the sweep as shown in the alternative section. The alternative also features a simple central boss design to heighten the oriental tone of the swept foot. Where it is helpful to hold in a straight recess that is larger than your jaws, consider turning slip-on extensions in hardwood or MDF. 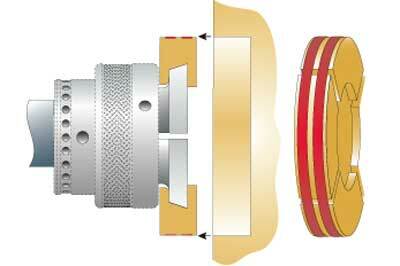 A close-fitting recess to match your jaws will provide sufficient stability for most short projecting work - say up to a 200mm (8in) outside diameter being turned to suit the recess in the workpiece.